It’s no secret that Portland, Oregon is the epicenter of a thriving revival of Southern old-time music in the United States. Led by pioneering old-time band Foghorn Stringband, Portland has encouraged a homegrown DIY old-time music scene that encompasses frequent square dances, multigenerational old-time bands, and a trailblazing festival in the Portland Old-Time Gathering. Founded by Michael Ismerio, a young fiddler and square dance caller (check out his website; it’s got lots of tunes to listen to! 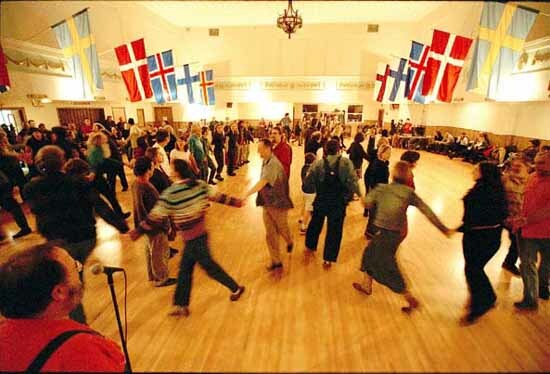 ), the annual gathering started as a bar concert and house party at Michael’s home and has grown to an event that brings over a thousand musicians and dancers from all over the US to Portland’s Norse Hall. For three days from Friday-Sunday (Wed, Thurs and Mon events are held elsewhere), this large building is filled completely with music and dance. The two ballrooms sell out quickly, concerts and workshops are packed, and every square inch and corner of the building is filled up with impromptu jam sessions. In the past few years I’ve been attending this event I’ve jammed in the bathroom, the kitchen, closets, hallways, anywhere I could find place to sit or stand. 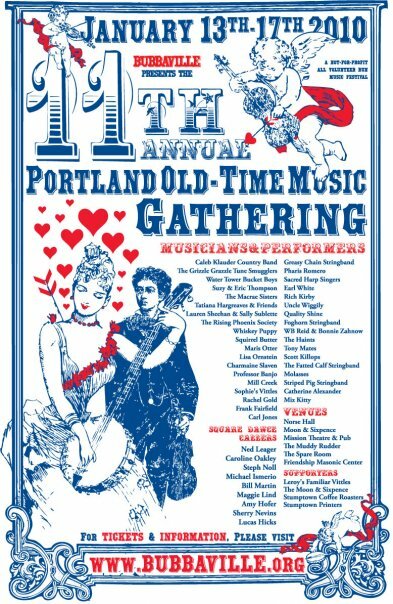 As a festival, Portland’s Old-Time Gathering is part of a new generation of folk festivals that emphasize community engagement and participation first and foremost. Bands come from all over but are chosen by committee and the emphasis of the festival is decidedly independent and DIY. Seattle enjoyed a similar festival recently with December’s Dare to be Square and other cities are following suit. The second annual Olympia Old-Time Music Festival will be held in February this year, for example. We encourage you to take a trip down to Portland to check out this one-of-a-kind event. It’s a golden opportunity to hear some of today’s best old-time musicians in an informal setting. Here are some videos from past gatherings to give you a feel for the event. Keep up with Portland’s trailblazing old-time scene at BUBBAGUITAR, local caller and organizer Bill Martin’s website. And check out this great documentary (excellent interviews!) on Portland’s square dance scene from Seattle photographer Doug Plummer. We’re excited about our next Folklife Masters concert this Friday, Dec.11 featuring John Reischman & The Romeros. The Folklife Masters concert series brings together two groups of master musicians from different traditions for an evening of collaboration and inspiration (click here for tickets). Jason & Pharis Romero will represent the the mountain ballads and square dance tunes of Appalachia, a tradition known as “old-time music”. Jason Romero is a master banjo player, capable of ranging from a Zen-like groove to blazing aggression. Have a listen to Jason’s playing of the traditional tunes Devil’s Dream and Last Chance. He effortlessly moves around the melody, transforming two square dance tunes into instrumental music that transcends our expectations. 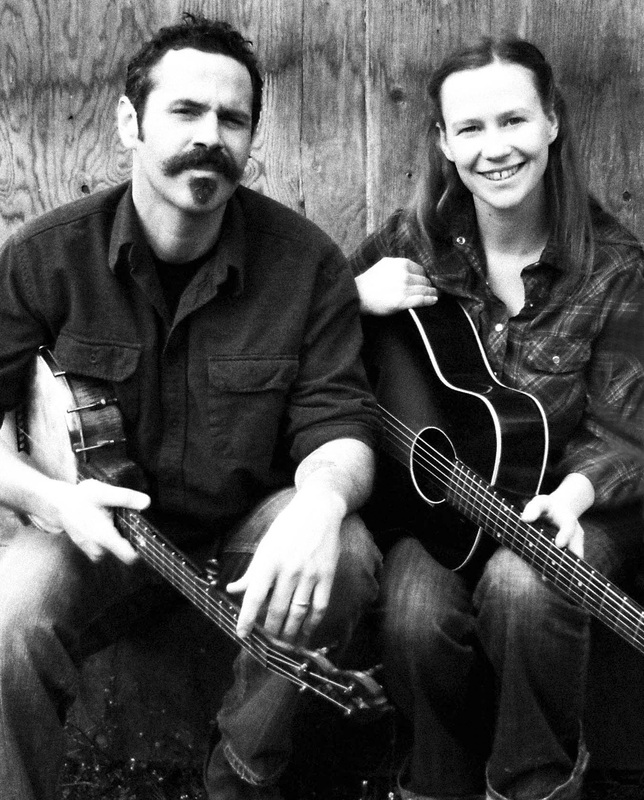 Pharis Romero joins Jason on guitar and vocals, bringing a wide range of emotion in her singing and a love for the backroads of American traditional song. Listen to this track of her and Jason dueting on the haunting medieval ballad Lowe Bonnie, the story of a spurned woman who stabs her lover to death. Listening to their exchange in the man’s final moments will raise the hair on the back of your neck. We’re excited to bring the Romeros down from Vancouver Island for an evening of trailblazing acoustic music. Having recently formed their critically acclaimed group, The Haints Old-Time Stringband, the Romeros are about to embark on a national tour and have been lighting up old-time jam sessions on the West Coast for the past couple of years. In fact, check out this powerful old-time session led by The Romeros and Erynn Marshall at the Festival of American Fiddle Tunes. The Romeros will be joined in this Folklife Masters concert by bluegrass mandolin master John Reischman and bluegrass vocalist Trisha Gagnon to explore the common ground between their traditions. Come out December 11 to Empty Sea Studios for an intimate concert unlike any other! These artists are coming together just for this concert, so it’s your only chance to hear them together.